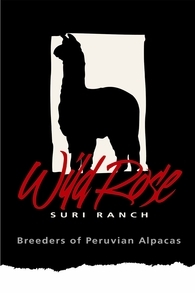 Wild Rose Suri Ranch offers Peruvian Suri and Accoyo Suri Mobile Breeding Service just in time for the upcoming alpaca breeding and birthing season. We regularly service the Maryland, Pennsylvania, Delaware, New Jersey, and Virginia areas with mobile services. Contact us for mobile breeding services in other states. Enjoy the peace of mind of having your dams and crias remain on your farm while they are bred to top quality suri herd sires. No exposure to a strange herd, new feed, or different management practices. Alpacas like consistency! Enjoy your crias when they are cutest and the most fun! Show off your crias to farm visitors - a great selling tool! We are full-time Suri Alpaca Breeders and have over 15 different full Peruvian herd sires with top bloodlines (including Accoyo), major show wins and championships, and proven production records for your mobile breeding. A large variety of colors of Suri alpacas and Accoyo alpacas are available: medium silver grey, brilliant whites, deep maroon, rich fawns, black, and multi's giving you diversity in both color and bloodlines across your herd. We offer top full Accoyo males, as well, from white to medium fawn. Most of our males have at least 1/4 Accoyo bloodlines out of such famous herd sires as Bruxo, Baron, Baccarat, Joselo, Ace, Uribe, Bruxo, and Maurizio. Need color in your herd? We offer show quality color-producing bloodlines from: Magnifico, Maelstrom, Cantano of Peru, and Razor. Click on the "Suri Herd Sires" for photos and links to more information. For Mobile Breeding Options, click here for details and pricing.